The passenger throughput of Chongqing Jiangbei International Airport stood at only 440,000 passengers in 1990, around 32 times less than that in 2010. The growth rate of passenger throughput in Jiangbei International Airport stood at 23% in the recent 5 years, becoming the highest one in the whole country. This airport has 77 domestic flight destinations. In total of 8 flight destinations have been added in 2009 such as Huangshan, Beihai, Tengchong, and etc. The direct flights to Europen countries will be restored in 2010. 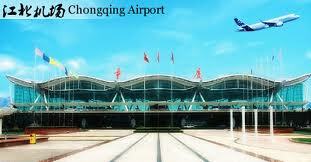 Rapid development of Chongqing’s electronic information industry will stimulate that of Chongqing’s airline industry. In order to meet the demand, the 3rd phase of expansion project of Chongqing Jiangbei International Airport is under construction.